Pony up--it's Pong Toss! Frat Party Games time. Compete against your friends or the computer in this ultimate party-game favorite. Play on a regulation table with up to four players. Make consecutive shots for the fireball bonuses and roll-vacks as you or your team try to dominate the table and reign as Pong Toss champs. In speed pong, up to three challengers can compete at the same time. Speed and strategy are the keys to this fast-paced game. Jack up your opponents by using a slew of power-ups that will slow them down. The first one who sinks the last cup wins it all. Be fast. Be furious. Be victorious. The graph below charts the compatibility with Pong Toss! 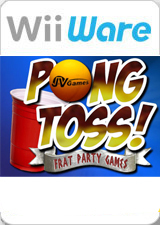 Frat Party Games since Dolphin's 2.0 release, listing revisions only where a compatibility change occurred.